Elizabeth Davey, nee Trewheeler (c1802 -1868), my great great great grandmother, was the fifth of my direct ancestors to migrate to Australia. This makes her the fifth of my ‘boat people’. Very little is known of Elizabeth’s early life. According to the informant for her death certificate, she was born in Truro, Cornwall and married there at the age of 20; her father was unknown and her mother was Catherine Trewhaler. 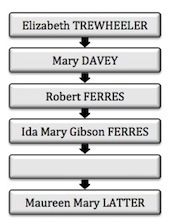 Elizabeth Tremellan Trewheeler was married, after Banns, to Ebenezer Davey on 7th January 1822 in Kenwyn Parish (about ½ mile north of Truro). Both were listed as “of this Parish”. Elizabeth signed her name as Elizabeth T. Trewheeler but the Minister clearly wrote her middle name as ‘Tremellan’.